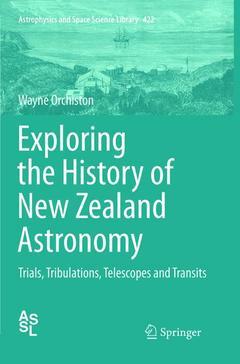 Dr. Orchiston is a foremost authority on the subject of New Zealand astronomy, and here are the collected papers of his fruitful studies in this area, including both those published many years ago and new material. The papers herein review traditional Maori astronomy, examine the appearance of nautical astronomy practiced by Cook and his astronomers on their various stopovers in New Zealand during their three voyagers to the South Seas, and also explore notable nineteenth century New Zealand observatories historically, from significant telescopes now located in New Zealand to local and international observations made during the 1874 and 1882 transits of Venus and the nineteenth and twentieth century preoccupation of New Zealand amateur astronomers with comets and meteors. New Zealand astronomy has a truly rich history, extending from the Maori civilization in pre-European times through to the years when explorers and navigators discovered the region, up to pioneering research on the newly emerging field of radio astronomy during WWII and in the immediate post-war years. A complete survey of a neglected but rich national astronomical history, this does the subject full and comprehensive justice. Chapter 1: Introduction.- Part I: Pre-European Astronomy in the Pacific.- Chapter 2: The Skies over Aotearoa/New Zealand.- Chapter 3: Mahutonga.- Part II: Cook Voyage Astronomy and New Zealand.- Chapter 4: Astronomy on Cook’s First Voyage.- Chapter 5: Astronomy on Cook’s Second Voyage.- Chapter 6: Astronomy on Cook’s Third Voyage.- Part III: Fundamental Astronomy.- Chapter 7: The ‘Cook’ Gregorian Telescope in The Museum of New Zealand Te Papa Tongarewa.- Chapter 8: Stephen Carkeek, the Wellington Time Ball, and New Zealand’s Oldest ‘Surviving’ Observatory.- Chapter 9: The Historic Astronomical Observatories in the Wellington Botanic Garden.- Chapter 10: The Thames Observatory of John Grigg.- Chapter 11: The Wanganui Refractor and its Remarkable English Equatorial Mounting.- Chapter 12: Joseph Ward.- Chapter 13: From Crossley to Carter.- Part IV: Transits of Venus.- Chapter 14: The 1874 and 1882 Transits of Venus.- Chapter 15: Refining the Astronomical Unit.- Part V: Stunning Spectacles.- Chapter 16: An Amazing Public Spectacle.- Chapter 17: John Grigg and the Genesis of Cometary Astronomy in New Zealand.- Chapter 18: C.J. Westland and Comet C/1914 S1 (Campbell).- Chapter 19: A Catholic Approach to Astronomy.- Part VI: Other Notable Astronomers and Their Activities.- Chapter 20: Great Comets, and Wellington’s Earliest European Astronomers.- Chapter 21: Henry Severn.- Chapter 22: John Grigg and his Pioneering Astronomical Photography.- Part VII: Opening a New Window on the Universe.- Chapter 23: Dr Elizabeth Alexander and the Mysterious ‘Norfolk Island Effect’.- Ch 24: John Bolton, Gordon Stanley, Bruce Slee and the Riddle of the ‘Radio Stars’.- Index. Professor Wayne Orchiston is a Senior Researcher at the National Astronomical Research Institute in Chiang Mai, Thailand, and formerly worked in optical and radio astronomy in Australia and New Zealand. He has published on the history of Australian, English, French, Georgian, Indian, Indonesian, Iraqi, Japanese, New Zealand and USA astronomy, and has supervised a large pool of graduate students. Like Tsuko Nakamura, Wayne has played a leading role in developing the history of astronomy through the International Astronomical Union Commission 41, and was responsible for the formation of the Historic Radio Astronomy and Transits of Venus Working Groups. He is the Editor of the Journal of Astronomical History and Heritage.